With Direct Ferries you can find a Ferry to Tangier Med and quickly and easily compare with other sailings to Morocco or neighbouring countries to ensure you book the best crossing available. Not only will you get a ferry price for your chosen sailing but we’ll also show you prices for ferries to Tangier Med around your preferred departure time as well as sailings to alternative destinations to ensure you get the best available price for your trip. Getting a price or making a booking couldn't be easier. All you need to do is select your preferred Tangier Med route from the menus, number of passengers and hit search. 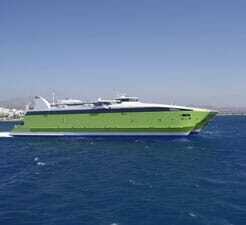 If you are looking for a Tangier Med Ferry departure, please visit our Tangier Med Ferry page. "Great Experience over Strait of Gibraltar"
"On Board Norman Asturias, Inter Shipping - Direct Ferries "
Direct Ferries gave us the best price for four pax when we booked online. The check in staff, at glance knew we didn't speak Spanish and communicated with us in English and were very helpful while issuing us our boarding pass prior to boarding. Staff on board were equally friendly and helped us in exchanging some Moroccan Dirhams for spending on arrival.